The dog was a sturdy Labrador retriever, sporting an au courant nylon backpack. He was effortlessly trotting toward me on the trail, which was a demanding 10-mile loop along Lake Michigan in northern Wisconsin. At the other end of the leash was an athletic-looking young woman wearing a turquoise daypack on her back. I have a vague recollection of being that young and having the energy to hike long trails replete with rocks, roots, and hilly terrain. But no dog I ever had could have done what that Lab was doing, and it got me thinking: How might my outdoor-loving clients prepare their dogs for an extended excursion through nature? First, some common-sense advice: Know thy breed! If you’re the proud owner of a Chihuahua, Lhasa Apso, or basset hound, chances are your adventures are best restricted to short trips. But hiking doesn’t need to be limited to working dogs or sporting breeds. Many medium-to-large-size healthy dogs can be conditioned to be your companion on the trails. Besides health and conformation, temperament is a consideration. Dogs that dislike walking on a lead are out. A shy, fearful, aggressive, highly strung, or barking dog might not only have a rotten experience, but also alienate fellow hikers. Leave that one at home. For the lucky dogs whose people regularly exercise them, no special preparation is necessary for an hour or two of walking. But longer trips, or those in difficult terrain, will require physical conditioning above your normal routine. A dog whose activity has been confined to sniffing around the back yard will need more time to whip his muscles and cardiovascular system into hiking shape. Veterinarians recommend starting your dog’s fitness walks pretty much the same way you would start your own: gradually and with regularity. Start four to six weeks before your planned excursion, longer if either of you have been sedentary. A typical conditioning program for both you and your dog would look something like this chart, and you can start anywhere on the table, depending on both of your physical capabilities. You can also spend more time on each distance if you or your dog need it. At the end of two weeks, or when you and your pooch can easily walk for an hour, increase the length of the walk by 15-minute intervals every few days, adding rest days every two to three walks. Work up to doing at least half of your planned hiking distance a few times before your trip. Like to run? A 30-minute jog with your dog is equivalent to a couple of hours on the trail. 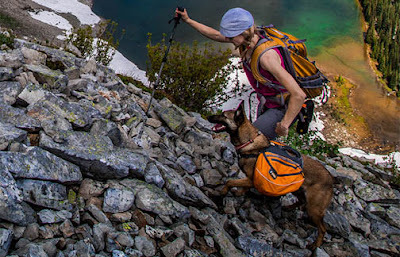 If your dog will be wearing a backpack, put an empty one on his back in the beginning, then gradually add the items that he’ll be carrying as you train. But keep the pack light; too much weight will put stress on his joints and tire him out. A well-conditioned working breed can carry at least 25 percent of his weight, but your 40-pound wheaten terrier might be able to manage only 10 percent. It’s always more engaging to have a destination during the training period; how about a vigorous march to a Starbucks drive-up window for a cuppa joe for you and some water and a tasty morsel for your four-legged friend? There are a few more things to remember. Of course you’ve already checked on the regulations covering the areas where you’ll be hiking; some parks, including most national parks, don’t allow dogs to share the trails. Also, I recommend you use a six-foot lead. Ditch your extendable leash. Hydration is crucial for an active dog; bring plenty of water and food. Streams, ponds, lakes and standing water can harbor bacteria and parasites, so packing your own H2O is essential. Take breaks for water and snacks every half-hour or so. Collapsible food and water dishes will come in handy. If your hiking buddy is panting excessively, find a shady spot and rest until he recovers. Cooler weather and fewer bugs in the late summer and fall make it a perfect time to get fit with your best friend. Muhammad Ali said “I run on the road, long before I dance under the lights.” Follow his advice: Whether your goal is a two-hour traipse through the forest preserve or an all-day adventure in the Rockies, preparation is the key to a great experience! Marley is a 136-pound Cane Corso, and her person was doing his best to drag her into the exam room. Once in the room, she retreated behind him, cowering as I approached. Ten minutes of plying her with treats and happy talk (that silly gibberish we use when we don’t think anybody is listening!) did not quell her anxiety. It was abundantly clear that I wouldn’t be able to do any kind of exam. I actually had to leave the room and have the client take a photo of Marley’s skin lesion, which he then showed me on his smartphone. Thank goodness for digital marvels, but the situation had me yearning for something better: having people train their dogs to enjoy coming to our office, or at least to accept it without fear. Besides trembling and escape behavior, frightened dogs at our animal hospital might also bark, growl or bite, and act unruly. I vividly recall the grief I caused my mother when it was time for me to go to the doctor as a child. I remember the frantic sobbing and difficult behavior, but most of all I remember the fear. I relate to my patients that get sweaty paws coming to our office. Acclimating your dog for a trip to the vet comprises two techniques: desensitization and counter-conditioning. Desensitization involves exposing the dog to a low-level stimulus, then gradually increasing the stimulus as the pet gets used to it. It’s a slow technique unless it’s combined with counter-conditioning. In that approach, you train the dog to have a different emotional response to a situation. Doing a mock veterinary exam at home is a good starting point. Depending on your dog’s size, put him on a table on a mat or towel, or leave him on the floor. If a small dog hates being picked up, up he goes, then he gets a treat, then down he goes; repeat a few times a day until he accepts it. Then do the “exam”: Hold his ears and look in them, give him a treat; open his mouth and give him a treat; extend his legs, run your hands over his body, pick up his tail, and anything else you can think of, always rewarding him with a favorite treat each time. You’ll want to do only as much as he feels comfortable with. So if he hates having his tail touched, start by gently touching it and rewarding him. When he accepts that, gradually do more and more, rewarding him each time, until eventually he allows you to pick up his tail. If he pulls away or shows any fear, you’ve done too much; back off and resume with a lesser stimulus. The mock exam is the desensitization part, and the food is the classical counter-conditioning part. Always do this training when the dog is hungry. Once you know those techniques, you can try other ways to teach him to accept going to the animal hospital. Pull into our parking lot, feed him a few treats, then leave. Once he’s comfortable with that, take him for a walk on the property, periodically giving him treats. You might have to gradually work up to having him step onto our front porch without fear, but when he does, he’s ready to come in the door. The best, but not only, time to do in-hospital desensitization here at VHAH is between noon and 1:30 p.m., when there are no doctor appointments. Walk in and tell the receptionist that you’re just here to train your dog to be relaxed when he has a real appointment. She’ll really appreciate the fact that you’re such a caring owner! Sit in the reception area and give the dog treats. When he’s happily munching his favorite snack here, you can leave, and next time you can go into the exam room -- more treats! Whether it’s during that visit or another one or 10 visits, work up to putting him on the scale, and also do your fake exam (put your smaller dog on the exam table). The more often you can do that, the more productive it will be, but even once a month during the training period is effective. 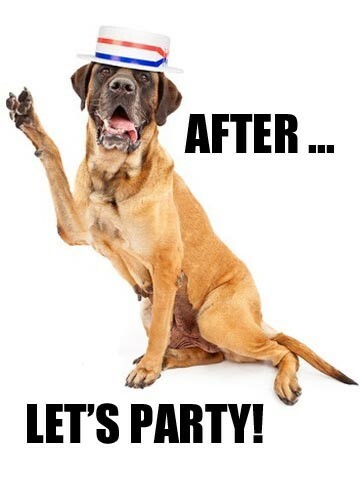 Once your pooch is comfortable taking treats in the exam room, an assistant can come in and do the same. Just ask the receptionist, and if someone is available they’ll be glad to give your dog some lovin’. They’re specially trained to know how to handle scaredy-cats (or, in this case, scaredy-dogs). Keep the sessions fairly short, and always end them when the dog is calm, even if it means backing off a little. So if he’s nervous in the waiting room, take him outside until he exhibits some type of relaxing behavior. (Sitting, sighing, tail wagging, or shaking himself are examples.) Then reward him by leaving. For all appointments, we recommend that you bring a hungry dog. Food is the best counter-conditioning tool we have. Some dogs don’t care about treats, so different techniques have to be used, a discussion beyond the scope of this post. But if a favorite toy works, bring it with you. Some dog owners are jittery when they bring in their best friend. 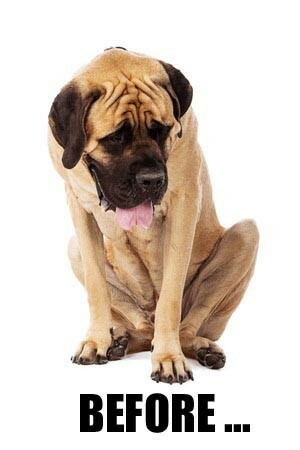 Try your best to stay calm and act normally; dogs pick up on their owner’s fear. The worst thing you can do is try to calm your dog by saying “It’s okay! It’s okay!” over and over. That gives even me the heebie-jeebies! There are hard-core fearful dogs that need muzzles, sedatives, or both, and I’ll address those cases in the future. As with most training, this can be incorporated into your routine in short time increments. If you’re driving past our animal hospital with your dog, take a few minutes to stop and do a mini practice session. If you touch your dog on a different part of his body every time you give him a treat, that’s great training, as long as you gradually increase the stimulus. Sometimes a veterinary exam is a life-saving proposition. Dogs like Marley, the Cane Corso, are at a distinct disadvantage should they need medical intervention. And even if it’s not life-or-death, every dog deserves a tail-wagging experience at the vet’s, if at all possible. So unless your pooch is a happy camper at our office, try some of these tactics. Oh, and did I mention this? Show up for your appointment with a hungry dog!